Captain America's biggest foe isn't a double agent or a purple alien — it's Kanye West. 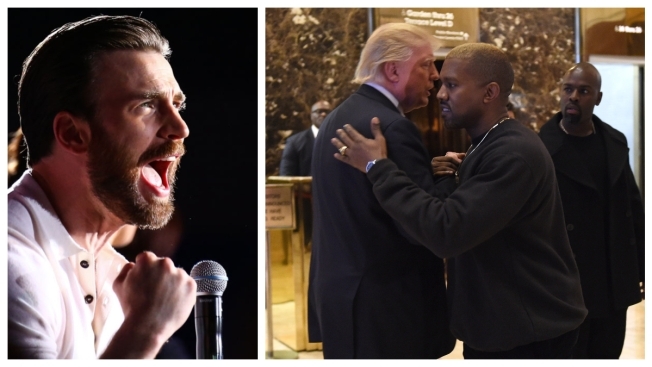 Chris Evans dragged West on Twitter Sunday for once again supporting Donald Trump and the president's policies. Hours after his "SNL" performance — and his non-televised rant was met with boos — West tweeted a picture of himself wearing a "Make America Great Again" hat. "This represents good and America becoming whole again. We will no longer outsource to other countries. We build factories here in America and create jobs," West said. "We will provide jobs for all who are free from prisons as we abolish the 13th amendment. Message sent with love." Ratified in 1865 after the Civil War, the 13th Amendment abolished slavery and involuntary servitude, but also "allowed for prisoners to be used as slave labor," writer Yashar Ali said on Twitter. "He doesn't articulate that in his tweet, leaving people confused and others delighted." Evans, who has been critical of the Trump administration, was tired of West. "There's nothing more maddening than debating someone who doesn't know history, doesn't read books, and frames their myopia as virtue. The level of unapologetic conjecture I've encountered lately isn't just frustrating," the actor vented. "It's retrogressive, unprecedented and absolutely terrifying." Actor Josh Gad supported Evans, tweeting, "Yes to everything." West also shared the photo on Instagram, prompting singer Lana Del Rey to leave a comment. "I can only assume you relate to his personality on some level. Delusions of grandeur, extreme issues with narcissism--none of which would be a talking point if we weren't speaking about the man leading our country. If you think it's alright to support someone who believes it's OK to grab a woman by the p---y just because he's famous then you need an intervention as much as he does--something so many narcissists will never get because there just isn't enough help for the issue," the singer wrote to West. "Message sent with concern that will never be addressed." Amid backlash, West went on to tweet that the 13th Amendment" is "slavery in disguise, meaning it never ended. We are the solution that heals." He backtracked, saying politicians should "not abolish" it, but rather "amend" it. "We apply everyone's opinions to our platform." The rapper has not responded to Del Rey, Evans or Gad directly. Instead, West, or YE, as he now wants to be called, said he will further explain himself in a "TMZ Live" interview Monday.